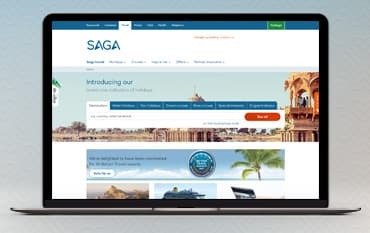 Where do I use my Saga Holidays voucher code? Visit the special offers section for great savings per person on holidays worldwide. Saga Holidays specialise in providing holidays for the over 50's to a wide variety of destinations around the globe. They provide UK short breaks, relaxing hotel stays, scenic river cruises, escorted tours to interesting places and ocean cruises that stop at exotic destinations. They offer singles holidays, no fly holidays, special interest holidays and all inclusive holidays. So, wherever you want to travel and whatever your interests, you are sure to find the ideal trip at Saga Holidays. On board one of Saga's exclusive ships, you could cruise along the Rhine or the Danube head to Bulgaria’s Black Sea coast, meander along the Dutch or Belgian waterways or visit the amazing temples and tombs of the pharaohs of Egypt on a Nile cruise. Saha offer all of this and so much more with their River Cruise itineraries and, if you can't decide which cruise to take then why not step aboard MS Johannes Brahms as she sets off on her mystery cruise. Each ship has been carefully chosen by Saga's experts for its combination of excellent facilities and service, and has passed their thorough quality and performance checks. Every ship has carefully-planned itineraries that will enable you to do as much or as little as you want to. Choose from a small, intimate ship or a larger vessel that can comfortably transport over 200 passengers. Croatia is one of Europe's most popular holiday destinations and no wonder, with its stunning rugged coastline, magnificent views, and over a thousand islands. It offers pristine beaches, delicious traditional food and is rich in culture and history, including a number of UNESCO World Heritage cities, Croatia has something to for everyone. The coastline here is spectacular with a host of idyllic islands that you can discover by ship or on foot. Enjoy wandering through the charming streets in the heart of Zagreb, Split and Dubrovnik, marvel at the beauty of the Plitvice Lakes and enjoy the rustic island charms of Korcula, Rab, Brac and more. Saga Holidays offer a great selection of holidays to Croatia including hotel stays and cruises. So, if Croatia is your destination of choice for your next holiday, then head to the Saga Holidays website and you are sure to find the perfect holiday for you. Spain has long been a popular holiday hot spots with the British. Partly due to it's easy to access but also because it's fabulous sandy beaches from the Costa Brava to the Balearics, the traditional charm of regions such as Andalucía and the welcome warm winter sun of the Canary Islands. If you want sand, sea, and sunshine on your holiday, then Spain has them by the bucket load. Saga Holidays offer a great range of cruises and all-inclusive hotel stays in Spain, designed to help you to relax and take it easy. You could opt for a Mediterranean cruise, go island hopping around the Canaries on an escorted tour, or, if you want to be more active, go walking around the scenic island of Majorca. Perhaps you like a bit of culture on your holidays in which case you could visit historic buildings such as the Moorish Alhambra in Granada or climb to the top of Gaudi's Sagrada Familia in Barcelona. Maybe you would just prefer to stay and relax in one of our Saga's excellent hotels situated along the beaches of the Costa del Sol, the Costa Brava, and the Costa Blanca. Whatever type of Spanish holiday you are looking for, you are sure to find it at Saga Holidays. Do you offer assistance for people with reduced mobility? Our holidays are specially created for the over 50s but travelling companions over 40 are also welcome. What is the cost of your door to door car service? Saga have been providing holidays and cruises exclusively for people over 50 for more than 60 years. They offer a wide variety of holidays from stays in excellent hotels and relaxing river cruises to cultural escorted tours and cruises to exotic destinations. You can choose from over 150 destinations including popular tourist spots like Portugal and Spain, to more unusual places such as Uzbekistan and Burma. They also offer holidays for singles and special interest holidays. So, if gardening, dancing, bird watching or photography is your thing, then take a look at the fabulous range of holidays on offer from Saga. We are constantly on the hunt for Promo Codes for Saga Holidays to help you with your money saving. Our experts check dozens of sites for secret codes including NHS discounts, student sites & social media channels saving you time & money!